Structured Illumination Microscopy of BPAE Cells with 100X 1.49 Apo TIRF objective. F-Actin excited at 488nm, mitochondria excited at 561nm, and the nuclei excited at 405nm; lambda ND acquisition. Impressive picture. Description - even more ! Are you positive about the wavelength though. 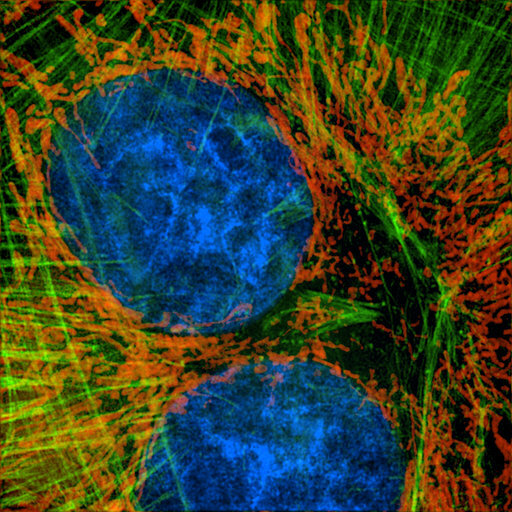 F-Actin (cytoskeleton) excited at 488nm (blue)? mitochondria excited at 561nm (green)? and the nuclei excited at 405nm (violet)? You are correct, but those are the emission spectrum, not the excitation wavelengths. ^ Thank you and sorry for my brain fart somehow the word "excited" did not register in my mind. Like scanning electron microscopy, I presume?